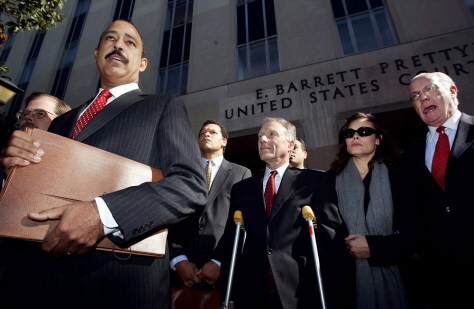 Lewis Libby, center, listens to his lawyer Ted Wells, left, speak to reporters outside federal court after his arraignment hearing in Washington, D.C. Also pictured are Libby's wife Harriet and lawyer Joseph Tate. U.S. v Libby, apparently have a dilemma. Scooter Libby's attorneys might be forced to win the case for their client. The email communication below, contains a possible explanation as to why Libby's attorneys have not yet demanded justice for their client Scooter Libby. Subject: You have a decision to make. The fact that you and your firm Dechert LLP represented Lewis 'Scooter" Libby in U.S. v Libby puts you in a very per-carious situation due to recent developments. As you can see from the Illinois Pay-to-Play article linked below, your client should never have been indicted much less ever brought to trial. And, as Libby's defense attorney in that case, it is incumbent on you to rectify this egregious misconduct on the part of the Dept. of Justice. The dilemma for you and Dechert LLP is, if you honor your obligation to your client and your profession, your partner at the firm, Glenn Fine, may lose his license to practice law. However, if you ignore your obligation to your client, you will lose the trust of those who have, and would consider hiring your firm, and you diminish your entire profession. Perhaps, even exposing the firm to legal complications and liabilities. Advance notice of your decision would be appreciated. Officers of the court are required to report illegal and or un-ethical conduct. Not to mention the obligation they have to their client. The conduct of the Dept of Justice in U.S. v Libby was both un-ethical and illegal. So, no dilemma, officers. Just do what's required! Oh, and could someone please wake up Inspector General Michael E. Horowitz. He needs to have a serious chat with the new FBI Director James B. Comey. The Libby "legal team" aka officers of the court.